Rising prevalence of heart conditions around the globe has proliferated the electrophysiology (EP) market, with patients becoming more aware about their treatment options and doctors gaining skills to carry out advanced procedures. Continuously growing population and their unchecked eating and smoking habits have resulted in increased occurrence of cardiovascular diseases (CVDs), aggravated further by increased physical inactivity. Gradually, the need for fast and accurate diagnostics and treatment of heart arrhythmia will boost the electrophysiology industry penetration. Growing geriatric population will also lead to higher number of heart disease cases worldwide. Owing to the incredible growth in elderly patients as well as unhealthy eating and drinking habits that lead to CVDs, the electrophysiology market was pegged at a valuation of USD 4.2 billion in 2017. Atrial fibrillation (AF) is reported to be the most common heart arrhythmia that is clinically diagnosed. Estimates show that almost 33.5 million people around the world have AF and about 70% of these are aged between 65 and 85 years. According to Cleveland Clinic, the number of AF patients in the U.S. could increase up to 8 million by 2050, demonstrating the massive potential for the electrophysiology industry in North America. The region is also witnessing higher propensity for obesity and diabetes due to extravagant eating habits. Boasting of some of the most advanced healthcare facilities, the region will also see a rise in the geriatric population and propel the electrophysiology market revenues. AF is known to increase the risk of a heart stroke and people with AF derived complications are more susceptible to fatal strokes. As such, efforts across the world are being taken to adopt EP at healthcare centers and technological developments are being pursued. CHRISTUS St. Michael Health System in Texas, about a year ago, established the first EP Laboratory in the Texarkana region with a USD 2.7 million investment. The organization aimed to enhance the level of heart care for the local residents and it also stated that heart diseases could go up by nearly 36% over the next ten years. 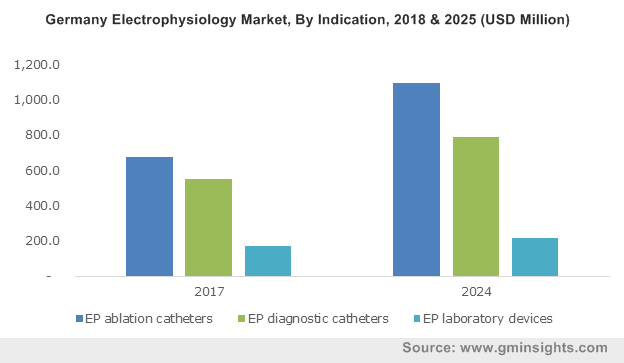 With many smaller cities and hospitals expected to install EP capabilities in the near future, the electrophysiology market will experience enormous growth over the forecast timespan. Recently, BioSig Technologies, Inc. had announced a collaboration with Mayo Clinic in Rochester, Minnesota, for developing a biomedical signal processing platform to support the technology needs of the electrophysiology industry. BioSig’s PURE EP™ System is an innovative offering with a cardiac signal acquisition and display system designed to help electrophysiologists take critical decisions during diagnosis and treatment of arrythmias. Through projects spanning two to three years, the company is planning to work with Mayo to develop new and advanced features of the PURE EP™ System. Pre-clinical results have apparently indicated huge potential of the system in improving the clarity of cardiac signals during ablation procedure. Essentially, BioSig’s EP system and its partnership with Mayo is just one example of the many innovations driving the electrophysiology market. Another novel approach to enhance the ease and application of EP procedures is found to be the deployment of augmented reality (AR) in assisting surgeons. Although AR technology still has a long way to go in the medical field, researchers have concluded that AR enables cardiologists to visualize and explore 3D images of the concerned section in the heart. These help to perform ventricular tachycardia ablation and other EP procedures by properly guiding the treatment. Innovations in the electrophysiology industry are witnessed in regions like Asia and Europe as well, since the prevalence of heart disorders is rising in these areas in conjunction with rapid urbanization and evolving consumption lifestyle. France’s Volta Medical, for instance, has unveiled the world’s first artificial intelligence (AI) software which will guide cardiologists and electrophysiologists while treating AF or open heart surgeries. The software, AIFib, would also be a vital tool in the diagnostics of AF and will replace the use of probes inside the heart. The initiative has trumped up new avenues for the use of EP and will help spread the capability of non-invasive EP diagnostics to a large number of surgeons. All in all, the global electrophysiology market presents a vast potential to innovate and develop enhanced approaches to the use of EP and is projected to amass remunerations of more than USD 6.5 billion a year by 2024. Several companies are attempting to develop and introduce novel solutions in the electrophysiology market, including key industry participants like Abbott laboratories, Siemens AG, Boston Scientific Corporation and Johnson & Johnson.